Who may play the lottery? Playing the lottery is an adult-only activity. Players aged 18 and over are allowed to play at Lottoland, regardless where they live. Lotto has finally entered the digital age: at Lottoland, you can hit both the massive EuroJackpot and EuroMillions Jackpots. The official state license number for Lottoland is 000-030840-R-312325-001. Which lotteries can I play at Lottoland? 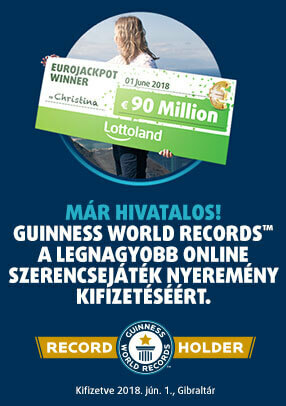 At Lottoland, you can participate in the EuroMillions and EuroJackpot lotteries. We also aim to further expand the number of lotteries on offer in the future. The "jackpot" refers to prize winnings in Tier 1 of a particular draw. To win the jackpot, your ticket needs to match the exact numbers drawn in the lottery. Learn more here here about how to maximise your chances of winning the jackpot. Play here, for your chance to take the jackpot home! With Lottoland, your prize payout is guaranteed. Once the jackpot has been drawn and the prizes determined, your winnings will automatically be credited to your player account. You can then either withdraw your winnings to your bank account, or use them to crack another jackpot! How do I win the EuroJackpot? The EuroJackpot is equivalent to the sum of funds in the highest prize tier of the lotto. To win the EuroJackpot, you must match the 5+2 numbers drawn - it's that easy!